The first pioneers in the West were, as a rule, men who were seeking homes and free lands on which to settle and farm. Later came the hunters and trappers and those who traded with the Indians. Then came the merchants and the men who were to build cities and the super-structures of civilization. Such men were the VanNortwicks who were to construct the great railroads, develop the new country’s commercial resources and industrialize Batavia. The first VanNortwick, William, came in 1835. Like most of the early eastern immigrants he came by water. He left New York via boat down the Ohio River to St. Louis and then up the Illinois River and finally to Big Woods. When William found the Fox River, he saw the potential for waterpower for running factories. The Big Woods could provide a wealth of lumber. William’s son John was born in 1809. He grew up around men whose work it was to make money. His father continually wrote to him from Big Woods of the advantages of investing in this new territory. At the same time, he also encouraged him to stay in New York where he had some job security as a civil engineer. In 1837 when he came to visit his parents, John invested $3,000 in railroads and in efforts to harness water power. He financed the building of a flour and saw mill. The saw mill meant that no longer were log cabins needed, for frame houses could now be built. A large portion of the flour made at the mill went to Chicago so local farmers gained a profit from raising grain. John returned to New York to finish his work on the canals. When it was done, he brought Patty, his wife, and their five children to the Fox Valley. It was with his move to Batavia that the VanNortwick industrial empire really grew. John first accepted a position as the chief developing engineer for the Galena and Chicago Union Railroad. He became consulting engineer for the Chicago, Burlington and Quincy Railroad that was being built from Turner Junction (West Chicago) to Aurora. Later he served as president of the railroad for eight years. It was during this time that John became acquainted with Daniel Halladay, a windmill manufacturer from Connecticut, through Halladay’s agent John Burnham. John urged Halladay and Burnham to move to Batavia to be closer to the windmill market. The United States Wind Engine and Pump Co. was established in Batavia in 1857 where Halladay would make his mills. 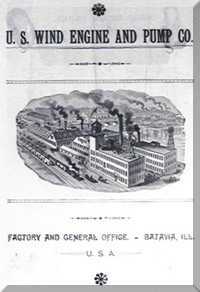 In 1867, John bought controlling interest in the Batavia Paper Company and became its sole owner two years later. The company expanded into one of the largest paper manufacturing companies in the country. John furnished the farmers with rye seed to get them to raise straw for use in his paper making. At harvest time the farmers’ teams lined up for nearly a mile along Water Street and to the west, waiting to unload their straw for use in the manufacture of paper. The company made paper bags, too, in buildings along First Street. The Western Paper Bag Company opened in 1882. It was one of the first manufacturers of square bottom bags. Some sources say the bags were invented in this factory; other sources say differently. The factory made twenty different-sized grocery bags and paper flour sacks. Sixteen machines made 1,500,000 bags a day. The plant closed in 1900 after local lumber was used up and it became too expensive to ship wood pulp from the family’s mills in Wisconsin. The family did not limit its investments to Batavia. John’s two sons, John M. and William S., entered the empire. In Appleton, Wisconsin, in 1873 a ground wood mill was organized, with William M. as a principal stockholder. He bought the company in 1876, and it operated with father John as its president and son William as vice-president. In 1881 William’s younger brother John S. moved from Batavia to Appleton to look after the family’s interests there. 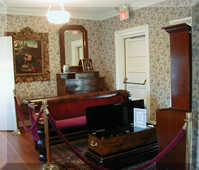 In 1888, William S. and John M. established the VanNortwick Bank in Batavia and built the building at 12 West Wilson Street. By 1896 the bank was insolvent and was taken over by the second First National Bank of Batavia that is today’s Harris Bank, Batavia. In 1890, the VanNortwick Paper Company listed these businesses on its letterhead, all with offices on the second floor of their bank building-VanNortwick Paper Company, Appleton Paper & Pulp Company, Kaukauna Paper Company, Combined Locks and Paper Company, Wisconsin Sulfite Fibre Company, and Western Paper Bag Company. William S. and John M. were in charge of the Appleton Manufacturing Company in Wisconsin. They made windmills that competed with those of the U.S.W.E. and Pump Co. In 1894, the brothers brought their business to Illinois and settled just north of Batavia between Fargo Boulevard and Fabyan Parkway. They built a company town named VanNortwick. Fire destroyed the plant six years later, and it was rebuilt in Batavia. One of those remaining buildings is now the Batavia Government Center. When John died in 1890, he was the wealthiest man in Kane County. He had come west with $3,000 in stocks and gold in 1836, financed his father and his sons, had gone broke more than once and still left an estate worth over $1,400,000, an immense sum at the time. See also Appleton Manufacturing Company and the U. S. Wind Engine and Pump Company.